The opportunities for fun outdoor adventures are endless when you travel in this GEO travel trailer. This unit allows you the flexibility of enjoying the camping life both indoors and outdoors with additions like the shower skylight that brings the sun's rays streaming into the bathroom while you get ready each morning and the outdoor kitchen that gives you the chance to perform your meal preparations directly in the fresh air. 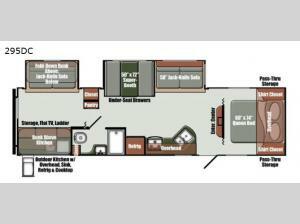 Because this unit can sleep ten people, everyone can join in on the exciting trips you take, and the two slides that have been included in this trailer provide extra space for everyone to travel comfortably. The Gulf Stream GEO travel trailer delivers considerable value because of the high-quality amenities it provides at an affordable price. From the decorative window treatments to the Congoleum vinyl flooring, the GEO is complete with style, and you can travel across the country with a clear conscience knowing that you and your family will be kept safe because of the LP/CO detector, smoke detector, and fire extinguisher that have been included. If you prefer to spend every available moment soaking up the fresh outdoor air, then you will love the addition of the electric awning with LED lights that gives you protection from the elements while you enjoy beautiful nature.